Our condominium is located on a 145-acre oceanfront resort with 24-hour security. It overlooks a beautiful 20-acre fresh-water lake surrounded by tall pines and plenty of open space. A walking bridge across the lake leads to one of more than ten pools on the property. Sidewalks lead to the beach and to the many activities that are on the property.Our property is located on the ground floor in Arrowhead court. We have owned the condo for the past 29 years and have continued to update it . The last update was over the past three years. New kitchen cabinets, granite counter tops, new appliances, back splash and flooring. Engineered hardwood flooring has been installed throughout the condo. Granite counter tops are in each bathroom along with tile floors.There is new dining room, living room and bedroom furniture. A health club is a short walk away (at additional cost). There are also hot tubs near the beach along with two pools. You can enjoy over a half mile of white beach that is great for families. A short walk on the beach will take you to the longest pier on the east coast. Our condominium is tastefully decorated with the living room/dining room and hall wallpapered. The two full bathrooms are wallpapered and have ceramic-tile floors. The kitchen is also wallpapered with a ceramic-tile floor and has a pass-through to the dining room. All cooking utensils are provided along with a blender, toaster, and disposal. The master bedroom has a queen-size bed with two lamps, two night stands, dresser with mirror and 26-inch HDTV with DVD/VCR. It also has full bath with all linens included. Second bedroom has twin beds with lamp and night stand, and dresser with mirror and 26-inch HDTV. It also has a full bath with all linens included. A washer and dryer and iron and ironing board are also in the unit. Check in is after 4:00P.M. and check out is By 11:00 A.M. unless other arrangements are made with owner. Denise and Tony with their three sons, three daughter-in-laws and eleven grand children.We used to tent camp on the site of where our condo is now. We have been vacationing in this spot for the last 44 years. Our children loved it and now our grand children are loving it. We chose to buy in Kingston Plantation. It used to be a campground that we always camped at. When it was bought and they started building condos we purchased one so we could continue to enjoy the property and the beach. Our condo is located on the site we used to camp on. Our boys loved the beach and now our grandchildren love the beach. The property is well wooded and you are able to walk around the property on the sidewalks. There is plenty of open space with flower beds and shrubs to enhance the beauty of the area. You do not feel closed in because the condos are spaced with a lot of room between the different condo complexes. handicap parking is provided in front of condo. Only two inch step up to entrance of condo. Wireless internet available throughout condo. Kitchen has service for twelve., toaster, can opener, coffee maker,and disposal. Also has new kitchen cabinets, granite counter tops and new tile floor. 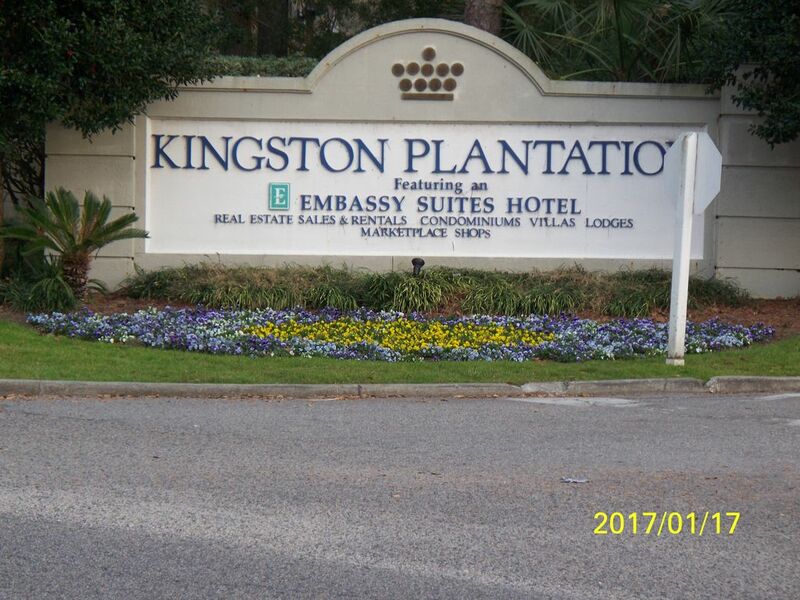 The condo is located in Kingston Plantation. There is a great amount of green space with sidewalks on the property. The condos are surrounded by tall trees and shrubery.